This is a copy of a letter published in The Daily Gamecock, October 21, 2013. Also online from the publisher. Click image for print version. Please cite as: Deflem, Mathieu. 2013. 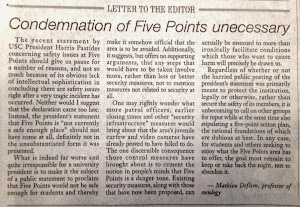 “Condemnation of Five Points Unnecessary.” Letter to the Editor. The Daily Gamecock, October 21, 2013, p. 4. The recent statement by USC President Pastides concerning safety issues at Five Points should give us pause for a number of reasons, and not so much because of its obvious lack of intellectual sophistication in concluding there are safety issues right after a very tragic incident has occurred. Neither would I suggest that the declaration came too late. Instead, the President’s statement that Five Points is “not currently a safe enough place” should not have come at all, definitely not in the unsubstantiated form it was presented. 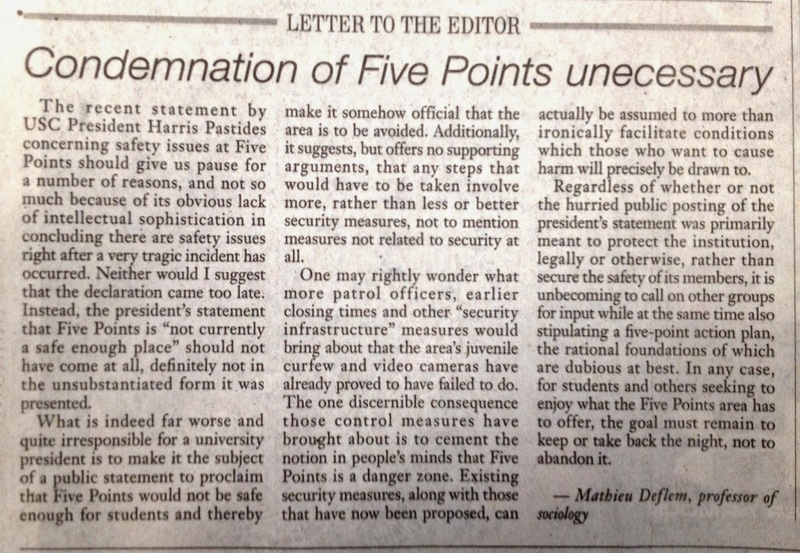 What is indeed far worse and quite irresponsible for a University President is to make it the subject of a public statement to proclaim that Five Points would not safe enough for students and thereby make it somehow official that the area is to be avoided. Additionally, it suggests, but offers no supporting arguments, that any steps that would have to be taken involve more, rather than less or better security measures, not to mention measures not related to security at all. But one may rightly wonder what more patrol officers, earlier closing times, and other “security infrastructure” measures would bring about that the area’s juvenile curfew and video cameras have already proved to have failed to do? The one discernable consequence those control measures have brought about is to cement the notion in people’s minds that Five Points is a danger zone. Existing security measures, along with those that have now been proposed, can actually be assumed to more than ironically facilitate conditions which those who want to cause harm will precisely be drawn to. Regardless of whether or not the hurried public posting of the President’s statement was primarily meant to protect the institution, legally or otherwise, rather than secure the safety of its members, it is unbecoming to call on other groups for input while at the same time also stipulating a five-point action plan, the rational foundations of which are dubious at best. In any case, for students and others seeking to enjoy what the Five Points area has to offer, the goal must remain to keep or take back the night, not to abandon it.